Herman Wouk's goal in his recently published The Language God Talks: On Science and Religion is not to conclusively resolve the knotty contradictions between science and Torah. Readers wanting a book that lists the problems and then responds point-by-point with direct answers should look elsewhere. Wouk, rather, provides a narrative that explains how he, an educated, cosmopolitan, thinking man (not that he calls himself that), sees little contradiction. The epigraph with which the book begins is the famous physicist Richard Feynman telling Wouk that Calculus is the language that God talks. The other epigraph is Shai Agnon telling Wouk that they are storytellers; they do not write thoughts but only stories. This second epigraph is Wouk's guiding light in this book. He tries, and succeeds except for a few monologues, to write this book of thoughts in the form of stories. The result is a text that requires literary interpretation, something at which I am no expert. However, what I can sense is that Wouk has two main dovetailing strategies. The first is his profound respect for science and scientists. The stories of many important scientists and scholars, whether the tale of their discoveries or his personal discussions with them, show a reverence for the genius of science and its greatest practitioners. The second theme is the humanity of scientists. These are people -- brilliant but fallible, and by no means unanimous in their scientific or religious beliefs. Nothing comes across more clearly than the personal background that underlies their religious beliefs. We are all, Wouk implies, influenced by our personal stories. We can see the same thing and, based on our differing perspectives, arrive at the exact opposite conclusion. Feynman saw the vastness of the universe and concluded that there is no God; Wouk saw the same and proclaimed that God is great. This is, presumably, why there is a great deal of fascinating autobiographical information in the book. This sophisticated man, Herman Wouk, is built on the sum of these experiences. 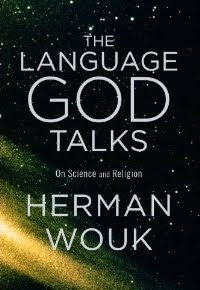 Wouk repeatedly points to his awe at the universe, briefly touching on classic science-religion topics but from a human rather than rigorous philosophical perspective. He is humbled and amazed at the vastness and orderliness of the universe -- the fact that a language called Calculus can explain so many different aspects of existence. Coupled with his reverence for traditional Judaism, for the life of devotion to learning and good works that he was taught by his ancestors, this tells his story of religious devotion that is detailed in other books (This Is My God and The Will to Live On). All these ideas together, woven together through multiple story lines that encompass decades of Wouk's 90+ years, teach us of the need to respect religion and science, but to walk humbly before God. Neither science nor scientist is infallible; both can be overturned at any time and there is often dissension within what seems to outsiders to be the monolith of scientific consensus. Yet genius is genius, and we have to respect it. In the end, Wouk does not resolve any contradictions. He teaches us how to live with them, embracing both Torah and science without relinquishing faith, observance or sophistication. UPDATE: Here is a review of the book in the LA Jewish Journal: link, in Newsweek: link. And here is an excerpt from the book: link.